Congratulations to Levi Berger, Winner of the Event #11 $2,500 No-Limit Hold'em Six Handed (473,019)! Today was the conclusion of one of the most action packed events of the summer, Event #11 $2,500 No-Limit Hold’em Six Handed. 14 players came back today for the Day 3 restart, and at the beginning of the day, Levi Berger held a big chip lead. He lost it before the start of the final table, and despite having an up and down final table, he ended up knocking out every single player, including Scott Clements heads up for his first gold bracelet, and $473,019 to boot. It took about an hour for us to lose our first player, and that was the last woman standing, Tamara Tibbles. She ran her ace-four into the ace-king of Mickey Petersen, and wasn’t able to catch up. We then lost Peter Turmezey in 13th, Gary Pearce in 12th, and Luke Vrabel in 11th, before Tuan Le busted in 10th in brutal fashion. Le got it all in preflop with aces against the sevens of Eddy Sabat, and he stayed ahead until the river brought a brutal two outer. Mickey Petersen busted in 9th place to Ben Palmer, and then Scott Clements took a big lead going into the final table after busting Marcio Cid in 8th and Clifford Goldkind in 7th, though Berger was still second in chips to start the final table. He got some more chips when his stayed in front of the of David Gonia, busting him in 6th. Two more hours went by before we lost Jacob Bazeley in 5th, and it was Berger who once again did the deed, when his flopped set coolered Bazeley’s top pair. Eddy Sabat bowed out in fourth place when he got his short stack in preflop with , and Berger called with . The flop brought trip threes for Berger, and Sabat could not catch up. Three handed play lasted for a couple of hours and through the dinner break before Ben Palmer busted on Hand #91. It was the hand before that virtually did him in, when Berger doubled after his flopped bottom two pair held against the top pair of Palmer. That left Palmer with a single 5k chip, and Berger’s beat the of Palmer, getting us to our heads up between Berger and Clements. Despite both players having nearly 100 big blinds, heads up play lasted just under an hour. In the final hand, Clements and Berger got the money in on a flop. Clements held for an open ended straight draw, and Berger had him in trouble, with . 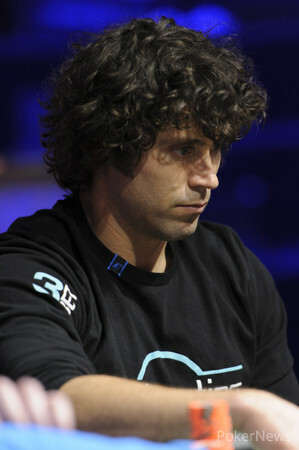 The board completed and , and Clements fell one spot short of picking up his third WSOP bracelet. 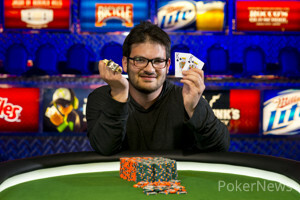 Congratulations again to Berger for taking down Event #11 at the WSOP. Berger’s win means that Canadians have now taken four bracelets this summer. Thanks for tuning into Pokernews for all of the updates, and so long from the Rio! Levi Berger of Canada wins gold in Event 11, a $2500 No-Lmit Hold'em (Six Handed) tournament. Hand #108 Levi Berger raised to 100,000 on the button and Scott Clements called from the big blind. The flop fell and Clements checked to Berger who bet 90,000. Clements check-raised to 245,000, Berger reraised to 580,000, and after a few moments Clements shoved for about 2.4 million. Berger called immediately. Clements needed to catch a jack, six, or running two pair to survive. The turn was no help to Clements, nor was the river, ending his quest for his third bracelet. For his runner-up showing, though, he'll pocket $292,339. Hand #102- Levi Berger made it 100,000 on the button, and Clements called to see a flop of , and Clements check called a bet of 90,000. The turn brought the , and Clements fired out 150,000. Berger thought for a few moments before cutting out raising chips. Eventually, he put out a bet of 400,000, and Clements made the call. The river brought the , and Clements checked to Berger, who fired out 525,000. Clements tanked for a few moments before calling, and Berger rolled over for the nut straight. Clements mucked, and Berger took the giant pot. Hand #103- Clements call from the button, and Berger made it 175,000 to go. Clements folded, and gave the pot to Berger. Hand #104- Berger made it 100,000 on the button, and Clements called. The flop came down , and Clements check called a bet of 75,000. The turn brought the , and Clements check called again, this time for 170,000. The river brought the , and both players checked. Clements showed for ace high, and Berger showed for a pair of deuces to take the pot. Hand #105- Clements made it 100,000 to go from the button, and Berger called. The flop came , and Berger check called a bet of 105,000. The turn brought the , and both players checked. The river was the , and Berger checked to Clements, who fired out 315,000. Berger tanked for about 90 seconds before he announced call, and Clements tabled . Hand #107- Clements made it 100,000 on the button, and Berger three-bet it to 270,000. Clements folded, and Berger took the pot. Hand #95: Scott Clements raised to 125,000 on the button and Levi Berger defended his big blind. They checked to the river of a board where Berger bet 70,000. Clements min-raised to 140,000 and Berger called. Clements showed , Berger tabled , and they chopped the pot with Broadway. Hand #96: Levi Berger raised to 100,000 on the button and Scott Clements called from the big blind. They checked to the river of a board where Berger bet 115,000. Clements folded. Hand #97: Scott Clements raised to 125,000 on the button and Levi Berger called from the big blind. The flop fell and Berger check-called a bet from Clements. Both checked the turn and Berger bet 285,000 after the river. Clements called, winning the pot with . Hand #98: Levi Berger raised to 100,000 on the button and Scott Clements three-bet to 290,000 from the big blind, Berger folded. Hand 99: Scott Clements limped on the button and Levi Berger checked his option. They checked to the turn of a board where Berger check-called 50,000 to see the river. Berger checked to Clements who bet 115,000 and promptly folded. 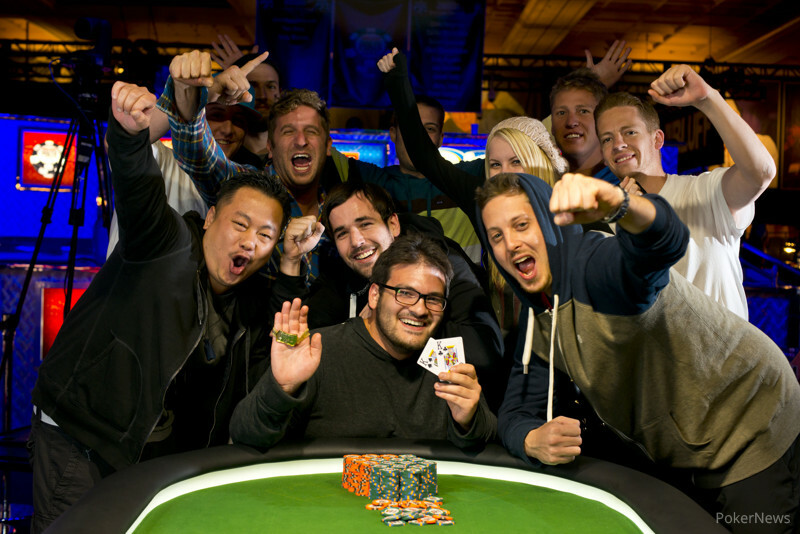 Hand #100: Levi Berger raised on the button to 100,000, and won the pot. Hand #101: Scott Clements limped on the button and Levi Berger checked his option. They checked down the board and Clements took it with . Hand #92- Levi Berger made it 100,000 on the button, and Scott Clements defended his big blind. The flop came , and Clements check folded after an 85,000 bet from Berger. Hand #93- Clements limped on the button, and Berger checked his option. The flop came down , and Berger check called a bet of 55,000. The turn brought the , and Berger check called again, this time for 75,000. Both players checked the on the river, and Berger tabled for a pair of jacks. Clements mucked his hand. Hand #94- Berger made it 100,000 on the button, and Clements made the call. The flop came down , and both players checked. The hit the turn, and Clements checked again. Berger fired out 55,000, and Clements called. The river was the , and Berger fired 140,000 after Clements checked. Clements folded, and Berger took another pot to extend his lead. WSOP Event 11 Gold Bracelet Winner Levi Berger and friends celebrate his victory. Levi Berger gets a hug from a supporter.